Maybe homes in Nashville are holding value better than we thought. Between March and April of this year, home values rose 0.8 percent nationally, according to the Federal Housing Finance Agency’s Home Price Index. It’s the index’s first month-to-month improvement since May of last year. Values are down 19 percent since peaking 4 years ago. Private-sector data affirms the government’s report. 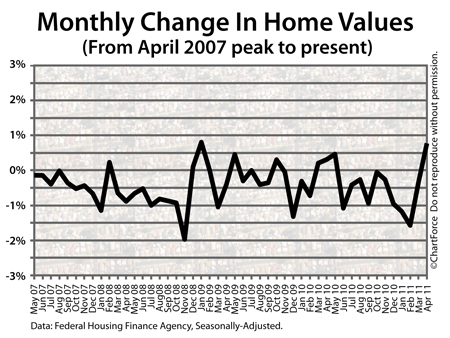 Tuesday, the S&P’s Case-Shiller Index also showed home values higher by 0.8 percent in April, on a monthly basis. Led by Washington, D.C. and San Francisco, 13 of the Case-Shiller’s 20 tracked markets showed improvement in April. In March, just 2 markets did. As a home seller in or near Spring Hill , it’s nice to see reports of rising home prices after multiple months of “bad news”. However, the data may not be as rosy as it appears to be. National real estate surveys including the Home Price Index and the Case-Shiller Index are flawed for everyday buyers and sellers. The biggest flaw is “age”. Both the Home Price Index and the Case-Shiller Index report on a near 2-month delay. This week, the calendar turns to July. Yet, we’re still discussing housing news from April. The housing market of 60 days ago was very different from the housing market of today. Mortgage rates are different, market drivers are different, and the pool of buyers is likely different, too. We can’t discuss today’s housing market with “April” in mind. The data is irrelevant. Another flaw is that both reports are national in scope. Real estate, by contrast, is local. When we cite the Home Price Index or the Case-Shiller Index, for example, and say “home values rose 0.8% in April”, we’re just giving a national average. On the local level, some markets rose by more, some rose by less, and others actually fell. People buy homes on a specific block of a specific street in a specific neighborhood. Data for homes like that can’t be captured in a national survey. The group that gets the most value from the Home Price Index and Case-Shiller is Wall Street and policy-makers. The indices do a fair job of reporting how housing behaves as a whole, but for individuals concerned with buying and selling homes, the best place to find real-time, accurate data is from a real estate professional.